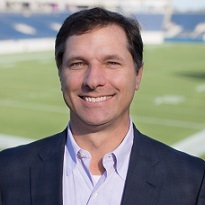 Steve Hogan is the Chief Executive Officer for Florida Citrus Sports (FCS), a non-profit event management company that is responsible for producing the Citrus Bowl, Camping World Bowl, Camping World Kickoff, Florida Blue Florida Classic, Florida Citrus Parade and other Central Florida-based events generating economic impact, and ultimately benefiting at-risk children and educational initiatives. Overcoming significant challenges and a recession which delayed the project, Hogan worked tirelessly alongside community leaders for nearly a decade to secure approval for more than $200 million to reconstruct the stadium in Orlando into a multi-purpose venue attracting marquee events. In 2016, Hogan was widely regarded as being the ―quarterback‖ who brought together leaders from the public and private sector to convince the NFL to move the Pro Bowl from Honolulu to ―The City Beautiful,‖ and make it a week-long celebration. FCS also secured a preseason NFL game between the Miami Dolphins and Atlanta Falcons set for later this year. Under Hogan’s leadership, FCS secured naming rights for what is now known as Camping World Stadium, an agreement that extends to the playing field in the form of the Camping World Kickoff between Ole’ Miss and Florida State on September 5. In 2013, Hogan was part of a group of community leaders responsible for creating LIFT Orlando, a 501-C3 organization aimed at breaking the cycle of poverty in Orlando's at-risk communities by partnering with residents to achieve shared goals of mixed-income housing, cradle to career educational pipeline, community wellness and long-term economic viability. Florida Citrus Sports is a founding partner of LIFT, attempting to realize Hogan's vision that the stadium is being used as a catalyst to create pathways of progress for our neighbors facing the toughest life challenges. Hogan serves nationally as a Past Chairman of the Football Bowl Association and has served locally as chair of Leadership Orlando. Other board service includes his involvement with LIFT Orlando, Orlando Inc., the Buoniconti Fund to Cure Paralysis, the Community Health Impact Council and the Economic Development Commission. After working for McCaw Communications and The New York Times, Hogan started his employment at Florida Citrus Sports in 1995 in the events department. He worked his way up to become Events Manager, Assistant Executive Director (COO) and ultimately interim Executive Director (CEO). After a nationwide search, Hogan was named the organization’s Chief Executive Officer in 2006. During his tenure, Hogan has worked on a variety of major sporting events. In 1999, he created a college football all-star game – The Villages Gridiron Classic -- from scratch, an event which lasted seven years on ESPN and boasted over 100 NFL draft picks. In his career, he has managed several NFL preseason, college football regular-season and international soccer neutral-site games. Additionally, he has negotiated television, title sponsorship and conference agreements that have elevated Florida Citrus Sports, and ultimately Orlando, into one of only three communities that stage multiple bowl games each year. Hogan is a graduate of Polk State College, and later the University of Central Florida. earning a bachelor’s degree in Advertising and Public Relations from the University of Central Florida in 1991. He and his wife, Angie, live in Orlando with their three children.